Born in Pittsburgh but reared in Hamtramck, Michigan, where he starred in baseball and football, Klewicki went to Michigan State University, where he was an All-American defensive end and the Spartans’ MVP in 1934. He was a member of the 1935 world champion Detroit Lions, the first year of a four-year NFL career. Edward L. Klewicki was born in Pittsburgh, Pennsylvania and moved to Hamtramck, Michigan with his family at a young age. At the time, Hamtramck was an enclave of Polish immigrants in the Detroit area. He graduated from Hamtramck High School in 1929. During his high school career, he was the catcher on the school’s first championship baseball team and starred in the backfield for the football team. Ed received his school’s highest graduation award for combining achievement in scholarship, athletics and citizenship. Klewicki moved on the play football at Michigan State College (later to become Michigan State University). His college coach, Charles Bachman, rated Ed as the best defensive end he had ever coached. The New York Sun selected him to the All-American 2nd Team in 1934, the same year he won Michigan State’s MVP Award. In 1935, Klewicki signed a pro contract with the Detroit Lions and was a member of the NFL’s World Championship team that season. He continued to play pro football through the 1938 season. Ed earned a B.S. degree from MSU and attended Purdue University for post-graduate work. He served in a number of positions including president of the Michigan State Varsity Alumni for two years as well as secretary for the same club for four years. In addition, he served as president of the Detroit Lions Alumni and the president of the Lansing Country Club. 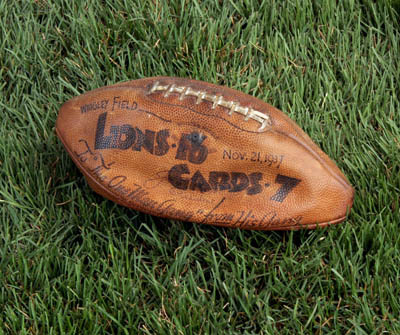 Ed Klewicki played a key role in the Detroit Lions’ 26-7 triumph over the New York Giants for the National Football League crown on a raw, gloomy afternoon at the University of Detroit Stadium before 15,000 fans on December 19, 1935. In the early minutes of play, Lions’ coach Potsy Clark decided to surprise the Giants with a shotgun offense. Glen Presnell, the Lions’ passer, fired a long pass intended for Klewicki, but the ball hit Giants’ Ed Danowski’s chest. The ball squirted high in the air, but Klewicki reached out quickly, gathered the ball in and put the Lions into scoring position from the two-yard line. Ace Gutowsky plunged for a touchdown, Presnell kicked the extra point and the Lions led 7-0 on their way to the championship.